1. 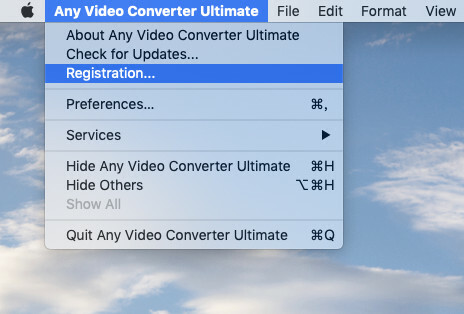 Locate and double-click the downloaded file named "avc_ultimate_mac.dmg" to start the installation. 2. Follow the instructions to finish the installation. 3. When you see a window where there is an icon of app, drag and drop the icon onto the desktop. Then you can just run the program from the desktop icon. Note: After installation, when you open the program, there will be a prompt dialog with the message” Installation of Chmod BPF Required”, please follow the instructions to install Chmod BPF to support more sites to download videos. 1. 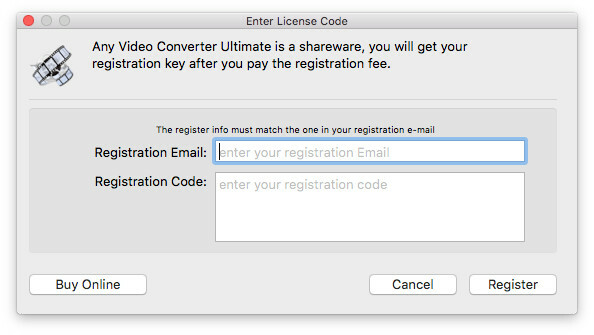 Run the app, then click the menu bar "Any Video Converter Ultimate > Registration". 2. After the registration box popped up, please fill the input blanks with Registration Email and Registration Code. You can also use Command+ C to copy and Command+ V to paste in the window. 3. Click "Regsiter" to finish registration. After you finished registration successfully, the limitation of your app's trial version will be removed. 1. Make sure that the Registration Email and Registration Code both are provided by our company after you pay the registration fee. If you have not paid, please click Buy online to purchase. 2. The registration information is case sensitive. And, please do not add blank at the beginning or the end of the word. Make sure the Registration Email and Registration Code you entered are both completely and correctly, if not, you will get an error message. If you have any other question about the license and registration, please simply mail to us: [email protected].